I travelled from working in Kenya to arrive in India last Saturday with my new shirt bought for this trip. Seemingly made to perfection for a leading UK retailer, I took it out of its packet and put it on. In our hermetically sealed Western bubble we end up thinking that strawberries, avocados and grapes grow on the supermarket shelf - not back breakingly harvested by real people in fields across the world. Likewise we end up thinking that shirts and every other garment just arrive on shelves of shops - not produced by real people with real lives. On Monday and Tuesday I started working with the ladies who make shirts for the world. We were invited by the supply chain to deliver a taste of our training into India's textile industry, just as we have been doing for the past few years into the agricultural supply chain in South Africa, Kenya, Senegal and in a few weeks time, the Ivory Coast. During the breaks between training (80% are women), we visited the factory floor where it all happens. Every cut and stitch carefully carried out by dedicated people. But on Wednesday I heard their stories. - the stories of the women who sew together the shirts of the world's major brands. I sat in a focus group with our wonderful translator hearing the story of their lives. Through tears they told their personal stories. 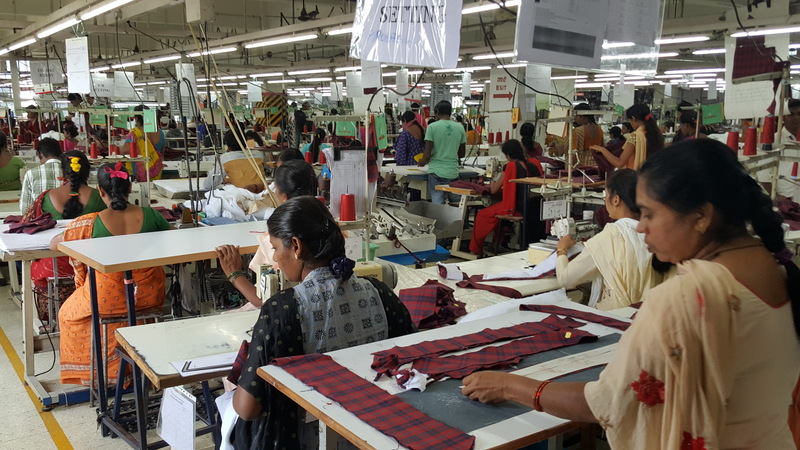 These were not the stories of the working day (the factory we worked with is progressive and caring and everyone was pleased to work there), but the lives they live outside of work and the wider story of the lives of the women that sit and sew my shirts for the shop I bought from. Stories of oppression and hope, of pain and joy, of dreams and heartache, of untimely family deaths and excited births. Our training is designed to wake people up to their potential, to lead every aspect of their own lives, to identify what keeps them from fulfilling that potential, develop new thinking and skills that will create new actions and new outcomes within themselves, their relationships, their communities, their livelihoods, as well as their working world. 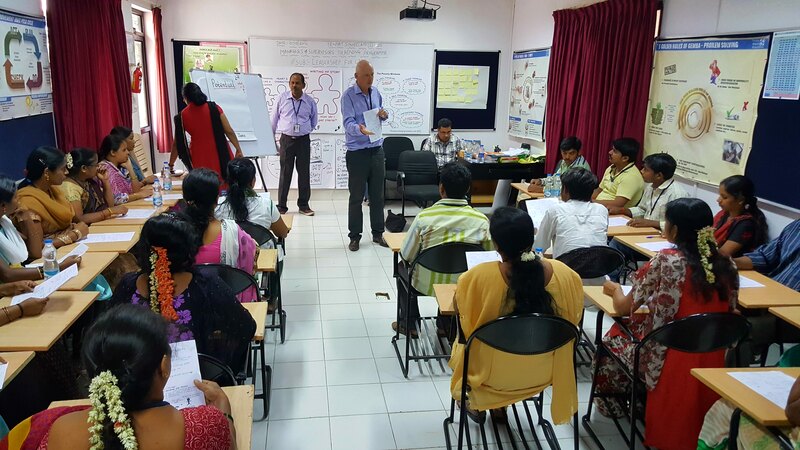 These were only taster or 'proof of concept' training events with just over 100 workers, to see how the training would impact in the textile industry of India and maybe beyond. What was the impact? Some might understandably say 'how can you measure impact after a few hours of training?' At Emerging Leaders we judge impact by both Lead and Lag measures. In other words if the training isn't making an impact of some kind on day 1 (Lead) then it is unlikely to make an impact a few weeks, months or years along (Lag). Within 24 hours we ran focus groups to gauge the Lead impact data and here are a few of the stories we heard. ..."I was going to marry off my daughter next year, as she's 17 years old. But after the training I decided to let her stay in school, so she can keep hold of her life-pen to write her own story"
..."My husband has had power over me all my married life (she's in her 50's), but since the Leadership training I've decided I'm going to stand up to him, even if he beats me, because I see now that I'm the leader of my own life"
....."The training has stopped me from giving up on my life - I thought suicide was my only way out - but now I have found hope and I believe I can face my fears; I have courage". ...."i felt stuck before and now i know i can move on"
....."i am going to get on that computer course. It was my dream. And because of the training i know i am going to do it"
.......The compliance manager said that she already saw a difference in how people came to work and their attitude at work and their desire to get more training as soon as possible"
When people awake to their potential, when mindsets shift the Lead impact is instant. We look forwards to reporting to you the Lag impact over the months ahead. A shirt will never be the same again. A shirt is now something with a face....actually many beautiful faces. The shirt on my body that carries the lives of the women who make them.